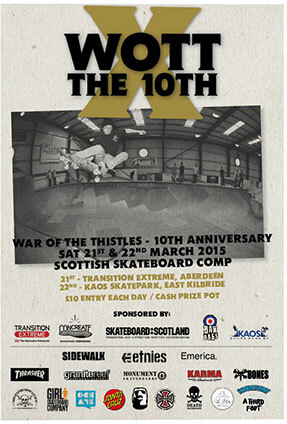 War of the Thistles 2015 – 10th Anniversary of WOTT! Posted byRick Curran	 August 21, 2014 March 6, 2015 Leave a comment on War of the Thistles 2015 – 10th Anniversary of WOTT! This year the venues are Transition Skatepark in Aberdeen on Saturday 21st and then the new Kaos Skatepark in East Kilbride on Sunday 22nd. 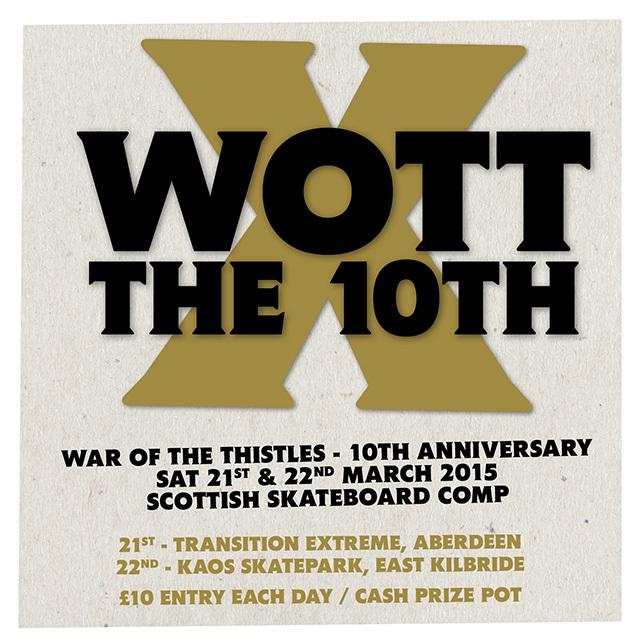 WOTT 2015 is the week after the Vert Attack comp in Malmø, Sweden so if you happen to be heading to Malmø then why not come over to Scotland for the following weekend and help celebrate 10 years of WOTTs!! !